Сборник адресован ученикам ДМШ и ДШИ, студентам училищ и всем любителям фортепианной музыки. The heritage of the German romantic composer Robert Schumann (1810–1856) consists mainly of piano works. Among the author’s favourite genres are piano cycles. Schumann unites the cycles’ pieces with an internal plot, and often with themes. 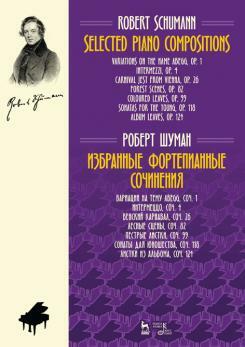 This edition includes Schumann's piano cycles, the earliest of his compositions – Variations on the name ABEGG, as well as Sonatas for the Young. The collection is addressed to pupils of childrens’s music schools and children’s schools of arts, students of music colleges and all lovers of piano music.